How total internal reflection takes place inside the reflector ? How is the light reflected back in the direction of incidence ? Can a reflector be used for measuring the distance of moon from earth? What are the shortcomings of a reflector ? 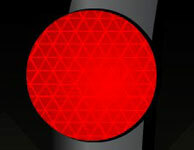 The red plastic reflector on the back of a bicycle is shaped so that light from a cars headlight hits the front surface at a very small angle of incidence. But the back of the plastic is angled. The light hits this surface at a high angle of incidence. Total internal reflection occurs. All the light bounces back , and is returned in the direction from which it came. No matter in which direction the light is incident on the reflector, it always retraces its path. So car drivers see the reflection of their own headlights in the reflector. 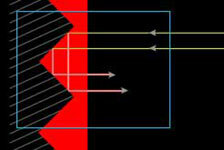 The same principle is used in automobile reflectors. 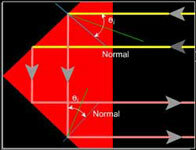 The question that can arise out the concept of reflectors is : Why cant a mirror be used in place of reflectors, the answer is that mirror does not reflect back the light in the same direction as the source so the source will not be able to see the reflector or the object like car, mototrcycle that has the refelctor mounted on it . The concept of the reflecting back along the same path is illustrated in the aninmation through a animated ray diagram. 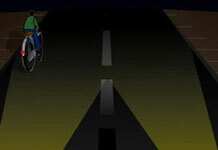 If you are still unclear about the concepts, please refer the animation. Ans: Even though you have registered and created an account on our site but you have neither purchased a subscription or any product hence the account is blank right now , after you purchase some products or subscribe to a package, your account will be updated to show the number of hours you can use to view our animations online or products you can download to your computer. Ans: Sumeet we do not have knowledge about the material of the punch, maybe you can refer to reflector manufacturers site. Ans: Though both are thermoplastics. Polycarbonate is about 30 times stronger than acrylic. Light transmittance is comparable (acrylic 92% and polycarbonate 86-89%), less brittle, softer, more impact resistant therefore ideal for outdoor usage ( Acrylic shatters on impact) less prone to cracking when being machined. Polycarbonates may be exposed to a variety of materials without corrosion -example ethyl alcohol, detergents, fruit syrup, HCl acid (20%), H2SO4acid (50%), fruit juices, and water. Ans: They are made from injection moulded polycarbonate or polyvinyl - because it is cheap and durable. Good quality reflectors meet EN13356(EN471) quality standards.